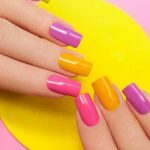 There are some awesomely good accessories around at the moment, enabling you to take your nail art to a whole new level. So, just for you, I’m taking a close look at the must-haves for your manicure kit. The instructions are really clear, so off I go. The addition of real flecks of silver, and microscopic glass particles means this powder gives a brilliant, mirror-smooth holographic surface that’s hard wearing and stays chip-free for ages. I dazzled everyone in the coffee shop, and will be using this again and again! The pots are quite tiny, and could do with being larger, although you use such a tiny amount each time. This is an awesome little set of powders. They all mix well, with a smooth, easy application. The colors and effects are impressive. The pearl powder is a little pale, more like an ivory. However, it’s still great, just paler than I was expecting. If you're looking for a kit that has it all, with a budget friendly price, this is it. Multiple Effects - Chrome Effect when you apply it on black base gel, Mermaid Effect and unicorn nail when you apply it on white base gel. Used with UV TOP COAT AND UV LAMP. If, like me, you’re a 3D addict, this massive set is perfect. It contains lots of styles, and so many of each one that you won’t run out mid design. The tweezers make placement so easy. The pots can be a little tricky to open, so don’t do what I did and throw them everywhere! If you're looking for a dream of a rhinestone kit, this is it! This makes any application of polish simple. Just paint it around your nails, and, as if by magic, no polish with be left on your skin. It’s great for geometric designs too, or in fact any design where you want the under-color to show through. It opens up a whole range of possibilities for nail art. To be honest, the smell of this latex barrier isn’t too pleasant, but the usefulness of this product makes that well worth putting up with. If you're prone to going over the edge, or want to create designs with cut-throughs to the color beneath, this is amazing stuff! These stick-on guides ensure that any design requiring nice, clean lines is easily achievable. But also they are great for building up your gel or acrylic nail extensions. When it comes to peeling these stickers off, take it slowly, as once or twice, I found that if you tear them off rapidly, a tiny amount of polish can come with them. With length and numbers marked on each nail form which provides an accurate guide for making your pretty nails. What a great set of brushes and other stuff! Well made and perfectly pointed, these brushes are brilliant for dotting, lines and even really fine details. The rhinestones, too, are nicely shaped, and the included tape is one of the best that I’ve tried. Why do they make these pots so hard to open one handed? Not all of us are organized enough to have everything ready at the start – or is that just me? This well packed kit contains everything you need to start on a career in nail art! Who doesn’t need a rhinestone dotting pen? I know I do. Those pesky little blighters get everywhere, so this is a godsend. It picks them up, and makes placement so easy. No more fiddly tweezers! The weight balance of these dotter pens takes a few minutes to get used to, so play with them before you start your nails. What can I say – this set of glitter and foil decorations for your nails contain everything and then some. Eco friendly ingredients, easy opening pots (and you know this is important), and lots of choice. I love this kit. My only, very minor complaint is that, while the amount of style is great, the number of pieces in each style could be greater. There are enough to do several sets of nails, depending on how you use them, however. For a mid range priced set of manicure/nail art tools, this is great. It includes brushes and pens (with 23 different tips), files, tapes, rhinestones, and very on trend Indian waterslide decals. I’m impressed with the quality of this professional standard tool set, and pleased to see some really unusual template designs for a change. The scissors don’t feel that strong. However, I’ve used them and still am, weeks later – so they can’t be that bad. This is a jam packed, professional looking kit. Definitely one for the shopping list. Sunuv’s addition to the curing lamp market is nicely made, durable and efficient. With lots of preset options, and plenty of room for every finger, this cures quickly, but without blinding you. The price band on this could put some people off, but it really is a great, professional quality curing lamp. We all need an awesome curing lamp and this model ticks every box - quick, energy efficient, and pretty. I love it!